2. BOSU Balance Trainer (BOSU) I want one so bad! 4. TRX Suspension Trainer (TRX) This is one of the coolest exercise inventions ever! 11. Dumbbells (GoFit) A necessity for an at-home gym! 12. Compression Socks (PRO Compression) Makes those calves feel so good! 16. Stability Ball (Reebok) Great for core work! 19. Foam Roller (SPRI) I don’t use mine enough, but they are great for those tight knots! 21. Reebok SubLite TR 2.0 (Reebok) I love my Reeboks! This style is perfect for training. What is the greatest fitness gift you ever received? Do you have an “at-home” gym or do you only workout at a real gym? 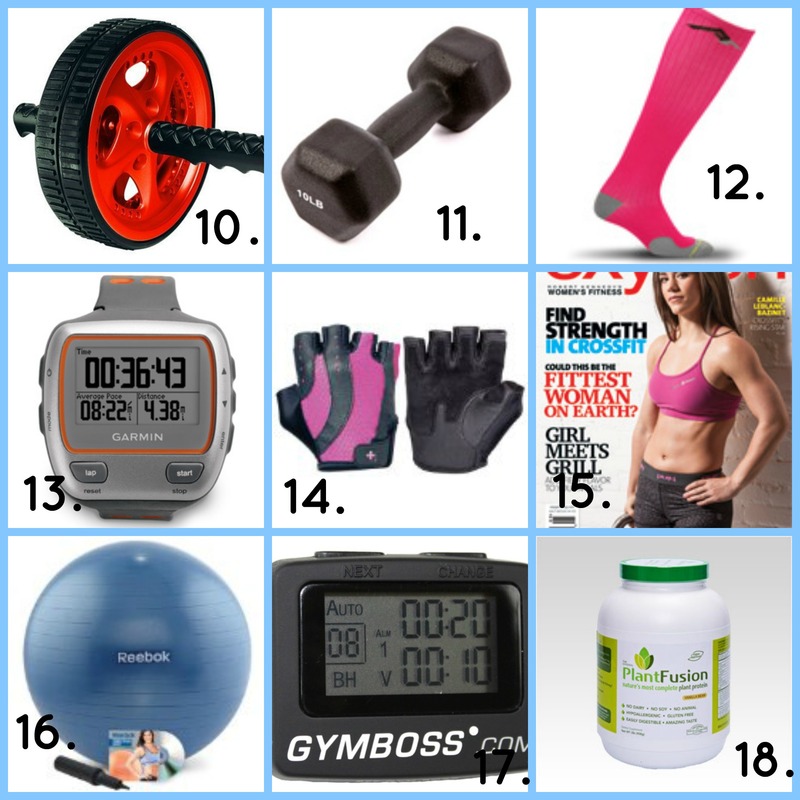 I am hooked on this really great list of gift ideas for the fitness enthusiast. 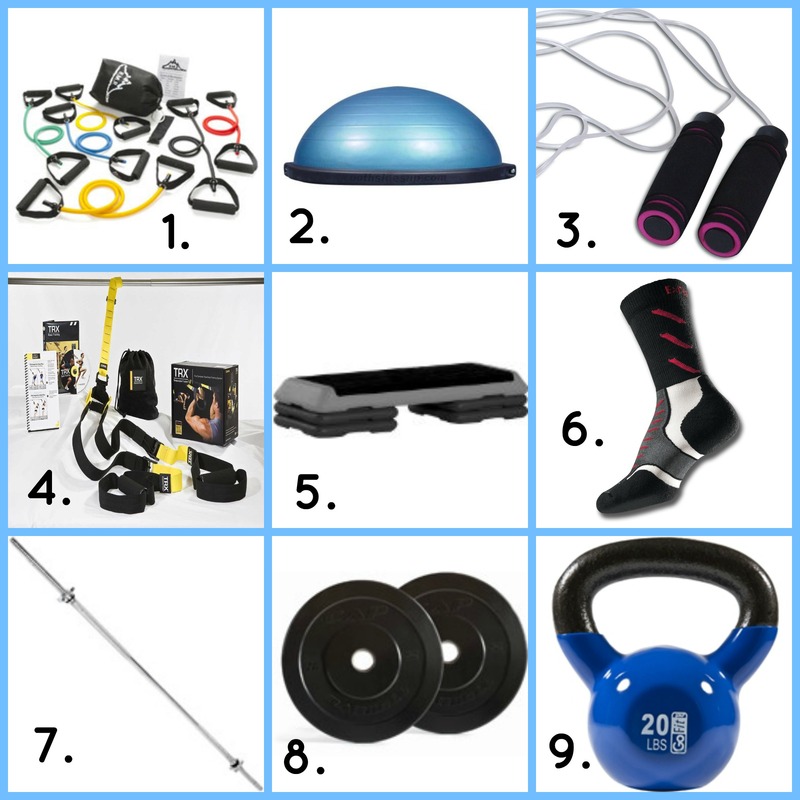 I personally want the kettle bell! That’s one of my 2014 fitness goals! I got so many good ideas from this collection. I usually work out at the gym but they don’t offer kettle bell classes yet. Thank you so much for sharing these awesome ideas at the Healthy, Happy, Green and Natural Hop! A kettlebell would be perfect for a quick at home workout because it can give you a total body workout in one piece of equipment! Oxygen magazine is a must-have for me. This year for Christmas I bought my fiancee one of those Primal Bells from Onnit (Kettle bells in the shape of monkeys and gorillas). He’s going to love it. Thanks so much for sharing with Share Your Stuff Tuesdays! I’ve seen those primalbells before! He will love it haha their awesome! Great list! Love all of this stuff! I’ve got a really nice home gym (treadmill, bike, elliptical, weights), plus I have my Fitbit and a HRM, so I feel like I’m pretty set already. My gym doesn’t have high enough ceilings for jump rope though. I subscribe to many of the magazines, Oxygen isn’t one that I have. We have that ab wheel, but I can’t do it at all! I’ve purchased several socks for my boys this Christmas (they like the Nike Elites for basketball) but haven’t tried anything special for myself. I actually do most of my workouts (elliptical/bike) in slippers! Haha working out at home is the best! I do burpees while wearing my robe 😉 I do wish I had a treadmill though, but we just have 2 stationary bikes. Those socks are like my favorite thing haha! I love workout clothes 🙂 they are some of the com first outfits to wear! Great wish lists! I’m a big fan of Thrive along with many of the other things you listed! The best fitness gift I received was my Pro Form Treadmill. I’ve been seeing a lot of jump ropes on gift guides!